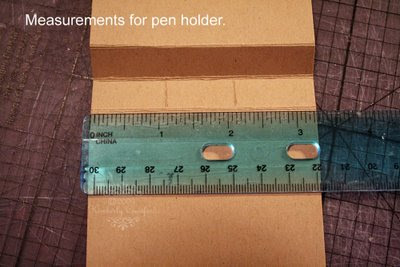 I was looking at a Post-It Note holder and thought, hey, let's add a pen to that. Maybe not new, or even original, but it was fun and would be a quick and easy gift for anyone. More cork! :) I added the dots with a Sharpie paint pen. 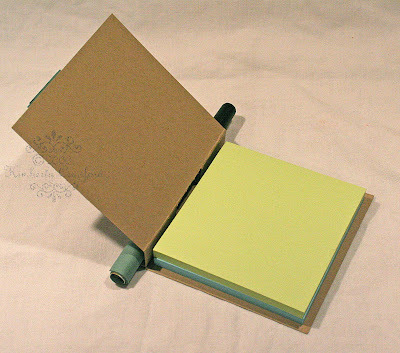 This size of this holder will accomodate two standard Post-It Note pads. THIS IS WRONG!!! Thank you to my sweet reader that pointed this out! I made the first one and it didn't work out. Then I made the second one, but listed the wrong measurements!! ACK! SO SORRY!!! 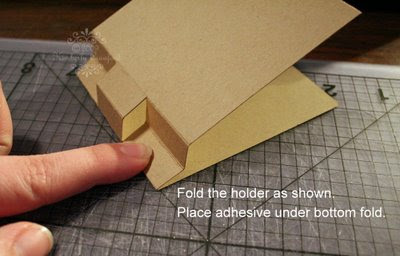 Make your paper 8" long. Everything else stays the same. Yes, that would be experience talking. :) If you have any questions, drop me a line. 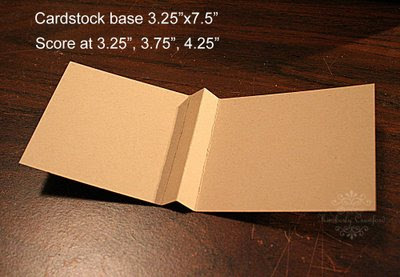 Here is my card for the Card Positioning Systems/Papertrey Ink Challenge this week. One part of the challenge was to make a card for a friend. I have made SO many friends in the online world. You encourage me, support me, make me laugh, and I am just so blessed by each and every one of you. Thank you, thank you, thank you! As you are reading this, I am teaching 2 classes and attempting to pack. DH and I are escaping for the week. I have posts scheduled, but more than likely won't have email or internet access. We will be back Friday sometime, so I will catch up with you then! Have a wonderful week! Can you keep voting for me too? VOTE HERE. Thanks!!! The layout is called Keeper, top right. 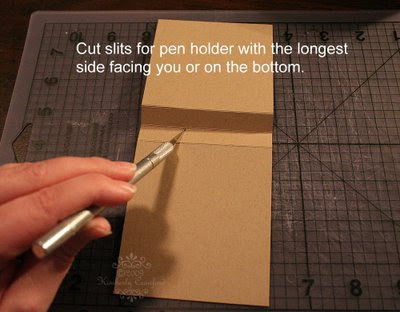 Awesome tutorial with the pen holder!! I'm going to have to try that!! On the second card, I love how you punched the circle and added the sentiment. Another awesome idea! Love the post it holder. That is so cute. I'm going to have to give that one a try. Have fun on your week away. We are going on vacation too! Must be the thing to do! 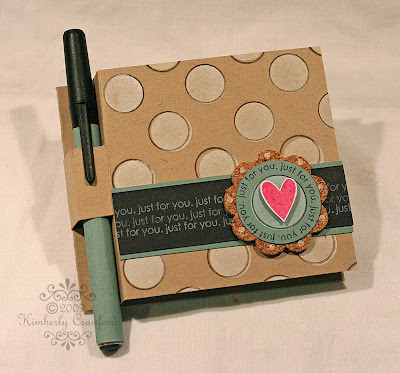 Great tutorial love the note/pen holder will be making a few of these. Have a great time on your vacation. I love the card. LOVE that book, Kimberly! Awesome! That card is just darling! How cute are these! LOVE the PTI and I love the mix of colors in the 1st! Have a good time away! 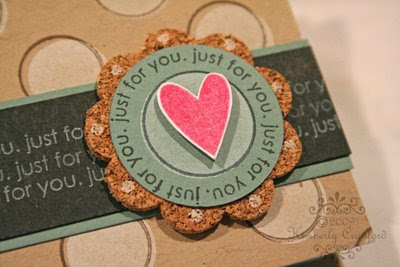 Very cute little project and your card is just so pretty! I love the color you used!! just beautiful! thanks for using the cps sketch! 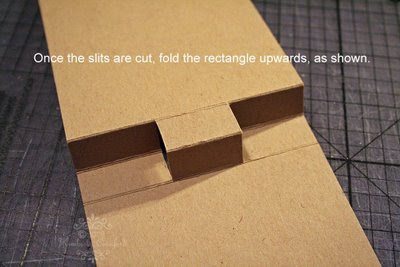 Fantastic Tutorial! I will be using this soon!